1. Heat oil in a pan over moderate heat.Sprinkle the asafetida powder. Add the breadcrumbs and sauté for2-3 minutes. Remove from heat and keepaside. the mashed potatoes over the tomatoes.Sprinkle with half of the cheese. Repeat the layering with zucchinis,basil, salt and tomatoes. 3.Sprinkle with the bread crumbs, patting itgently over the tomatoes. 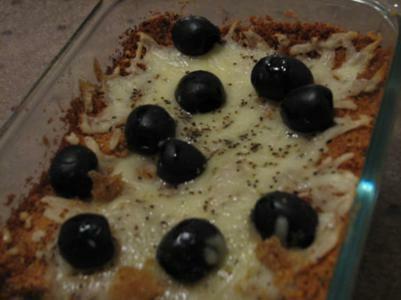 4.Bake at 350 F/180 C for 40 minutes oruntil the crumbs are golden.Remove from the oven and sprinkle with theremaining cheese and the olives. Bake again for 5 minutes oruntil the cheese melts. Serve hot.